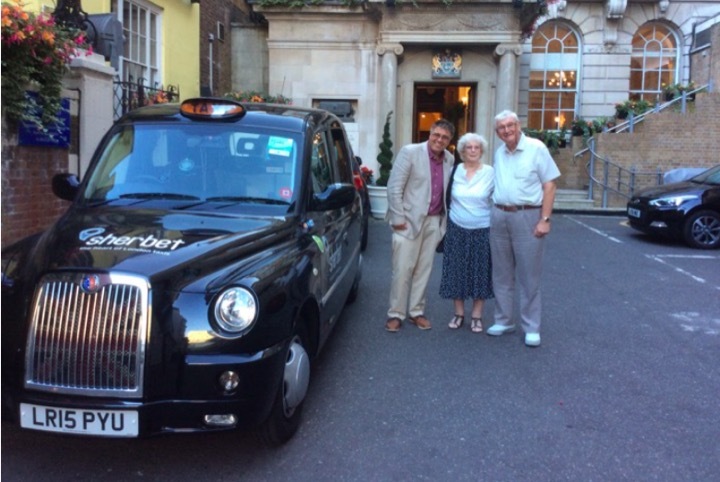 Having led tours for inbound tourists since 2008, I have to say that summer 2016 provided me with my favourite job to date – not because it was a well-paid day excursion to Stonehenge, Bath or the Cotswolds, but because Bill and Edna, a pair of ToursByLocals travellers, were coming home to Fulham! August 15th was not going to be just any 6-hour Day Tour with visitors to my city – sure I was going to provide my guests with a travel around all of London's iconic landmarks, plus some hidden secret movie location sites BUT I was also going to be taking folks ‘home’ to their roots, good old SW6, some 17,000 miles away from their current home in Sydney, Australia. That trip down ‘memory lane’ was going to be enjoyed at the finale of the day’s touring for Bill and Edna Williams – who would have no idea that their daughter Sue back home in ‘Oz’ had clandestinely arranged with myself and the current tenants in their old house in Elbe Street, Sands End for a surprise return. So with the relevant parties in on a ‘cloak and dagger’ top secret operation, this lovely couple in their 80’s had no idea whatsoever that they would end up having a cuppa in the home they left for good in 1960 – instead they had been expecting a ‘ride around our old neighbourhood in Fulham’ at some stage, and ‘maybe we could pass by and see if the old house is still standing’. I had to hold that secret for almost 5 hours, from meeting and greeting my clients at the Royal Overseas League Club in St. James’s until the late afternoon when precision timing would have them outside the front door they closed for the last time 56 years ago. It was business as usual at first, and after introductions at their temporary abode in Park Place it was time to transport them back 2,000 years to start with – to where the real deal started for London, close to where the Romans forded the River Thames soon after invasion in AD43. “I’m almost as old as that myself!” joked Bill as we then continued to take in the Norman Conquest at the Tower of London, and an opportunity to take snaps intended to be dispatched quickly to ‘down under’ – Edna was well up to the present with her tablet and was keen to send photos attached to emails throughout the day. We moved on during the morning to THAT Roman Wall, THAT Site of Execution, THAT Public Square of Jack the Ripper notoriety and THAT Roman Amphitheatre – and climbing in and out of the Taxi was never a problem for my 2 senior citizens during the excitement of returning to London as tourists. After lunch we moved upstream to Westminster where they could enjoy more recognisable icons, but as usual on my tours I managed to get Bill and Edna ‘under the skin of London’ as they got to hear about some of the capital’s more unusual facts and anecdotes. My London Day Tour includes a choice of walks, and as Edna once worked in St. James’s Street I showed them a few hidden secrets about this rather unique neighbourhood – but by late afternoon it was time to be Fulham-bound. Arriving in Sands End, Fulham was via Chelsea Harbour and Marina, which of course never existed the last time Bill and Edna were in town – and nor was the Imperial Wharf Overground Station, which as Bill pointed out would have saved him from miles of walking, when for many years he used to kiss Edna goodnight before walking home to East Acton, as there were no late buses in those days. It was interesting showing them both how much Fulham had changed in over half a century – but at least the old British Legion Club, where they once danced the fox-trot, was still standing! Edna also discovered the old house where her cousins once lived was still surviving on Townmead Road, but at last it was time at last to return to Elbe Street. I carried on with the pretence, but while Bill and Edna were preparing to pose for another photo outside their old home, the front door swung open to their delight and surprise! Current tenant Alice and her boyfriend Ricardo invited us in and could not have been more hospitable, Edna wasting no time in inspecting her old childhood home, one of only 3 houses she had lived in during her entire life – she found the room where she was born, which today is Alice’s bedroom, and when we ventured outside into the garden Bill caused amusement for the young couple when we wondered what happened to the outside toilet! We sat in the (much larger) kitchen (formerly the scullery) when another house-mate Beverley arrived home – she had also been in on the surprise. Edna and Bill continued to enjoy the company of their hosts, and after a few more happy snaps decided they really would have to leave the old house for the very last time – you can imagine how emotional they were feeling about the whole experience. On the way back to their hotel I showed them around the very much changed Fulham Broadway, but it was a fairly quiet drive back as they both reflected on both the past and their journey back there in my Time Machine. I have to say that of ALL the hundreds of guiding jobs by road and on foot I have led in 8 years, this was the one that gave me the most satisfaction – my clients could not have been more engaging and fun, but also this was also REAL SOCIAL history! Thanks for the memories Edna, thanks for all those incredible stories Bill, thanks for hiring me Sue!